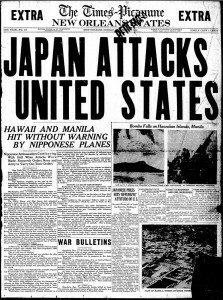 Today marks the 76th anniversary of the day the United States was suddenly and deliberately attacked the Empire of Japan and the United States would never be the same. We remember those brave men and women that died that fateful day. And we honor those that survived and fought on to defend the United States, freedom and liberty. The reprehensible and treacherous sneak act unified a country and awoke a sleeping giant that provided the resolve to win a war against the evil Axis. 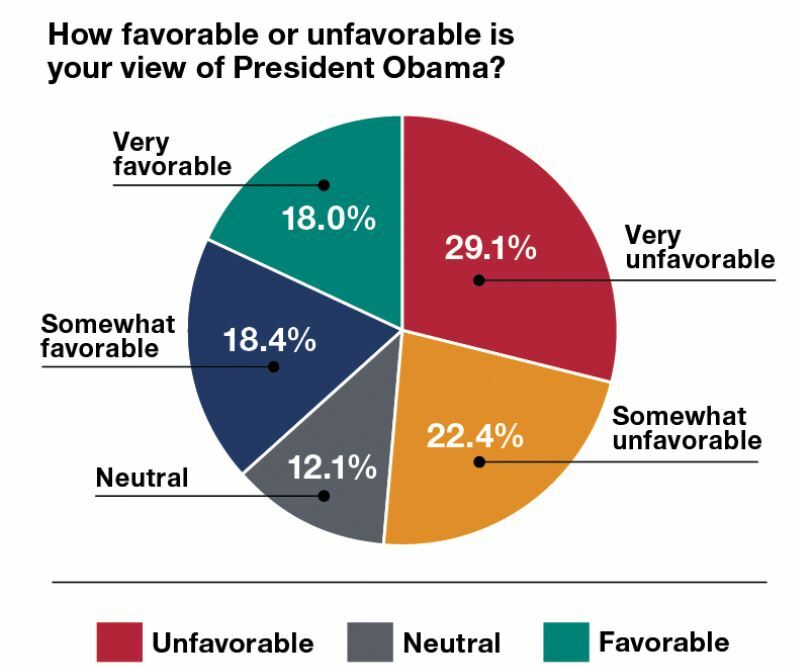 It was that resolve, leadership and focus on the enemy that enabled the United States and its Allies to victory. God bless all those who lost their lives on that fateful day. We give thanks, praise and remember those from Our Greatest generation who made the ultimate sacrifice 76 years ago today. 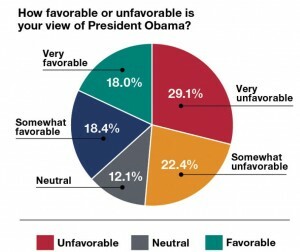 The Japanese did infact awaken a sleeping giant and America showed its great resolve. 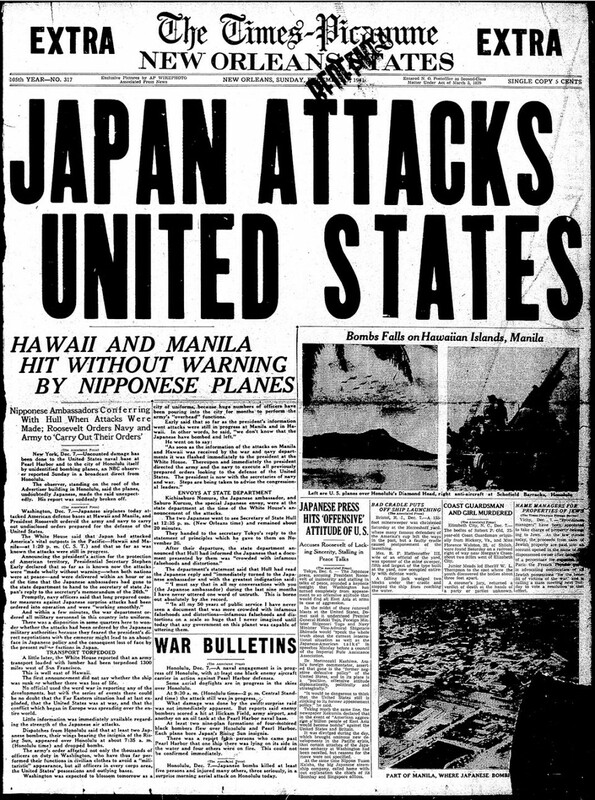 We ask all to always remember and never forget … Today marks the 75th anniversary of the day the United States was suddenly and deliberately attacked by the Empire of Japan and America would never be the same. So many brave lives lost at the hands of such a cowardly act. It was a time of innocence lost; however, Americans would strike back against their foreign aggressors and save the world from tyranny. Today, as always, we remember those brave men and women that died that fateful day. So many lives affected by that single heinous act; however, as history would record, Japan awoke a sleeping giant. That reprehensible, treacherous act unified a country and in fact awoke a sleeping giant that provided the resolve to win a war against the evil Axis. We remember those still living, sadly there are so few today. 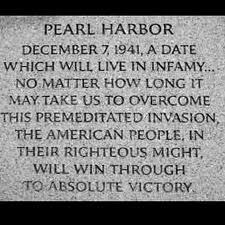 God Bless the heroism of Our Greatest Generation! VETERANS DAY 2016 … THANK YOU!!! Today on the 1th day of the 11th month we offer our thanks to all who have served and who currently serve in our military who protect our liberties and our freedom. We know all too well that Freedom is not free. It takes a special individual who is called to service to protect our liberties and freedoms. We thank the brave men and woman of our Armed Forces who have fought to protect our way of life. They are our true heroes. They are our role models. So many of our World War II veterans pass away ever day, the American heroes who like those that followed them into military service have made us so proud. Please take the time today to than a Veteran for their service. Thank you for your Service to Honor, Duty and Country. You have our never ending thanks for the sacrifices that you and your families have made so that we might be safe. Thank you and God Bless! UPDATE I: President Obama’s Veterans Day speech from Arlington National Cemetery. Secretary McDonald, Mr. Hallinan, distinguished guests and, most of all, our extraordinary veterans and your families: The last time I stood on these hallowed grounds, on Memorial Day, our country came together to honor those who have fought and died for our flag. 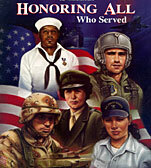 A few days before, our nation observed Armed Forces Day, honoring all who are serving under that flag at this moment. And today, on Veterans Day, we honor those who honored our country with its highest form of service: You who once wore the uniform of our Army, Navy, Air Force, Marines, or Coast Guard. We owe you our thanks. We owe you our respect. And we owe you our freedom. We come together to express our profound gratitude for the sacrifices and contributions you and your family made on the battlefield, at home, and at outposts around the world. But America’s gratitude to our veterans is something always grounded in something greater than what you did on duty. It’s also an appreciation of the example that you continue to set after your service has ended — your example as citizens.